In 10-inch nonstick skillet over medium heat, cook bacon 5 to 7 minutes until crisp; drain on paper towels. With serrated knife, cut each tomato in half crosswise. Using teaspoon, scoop out seeds and pulp from each tomato half, leaving enough tomato for a firm shell. If necessary, cut small slice from bottom so tomato half stands upright. In medium bowl, combine lettuce and ranch dressing. 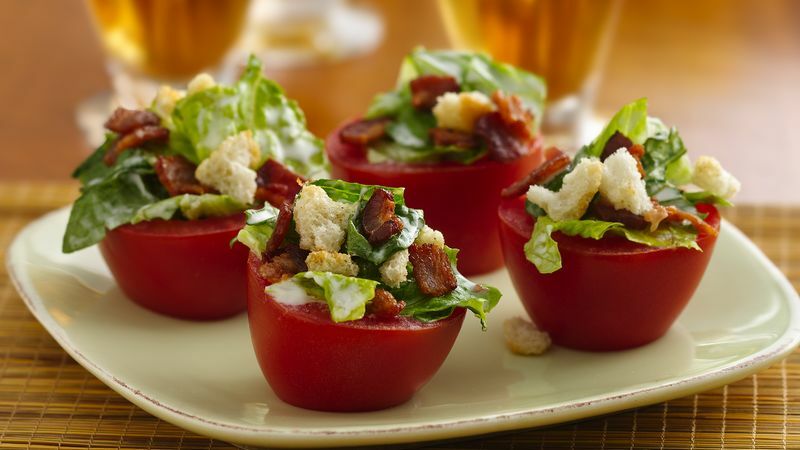 Using small tongs or fingers, fill tomato shells evenly with lettuce mixture. Sprinkle with bacon and croutons. Serve immediately or refrigerate for up to 1 hour before serving. If desired, sprinkle evenly with about 2 tablespoons of finely shredded Cheddar cheese.